Dame Judi Dench, whose new film "The Best Exotic Marigold Hotel" opens May 4, is losing her eyesight to macular degeneration. 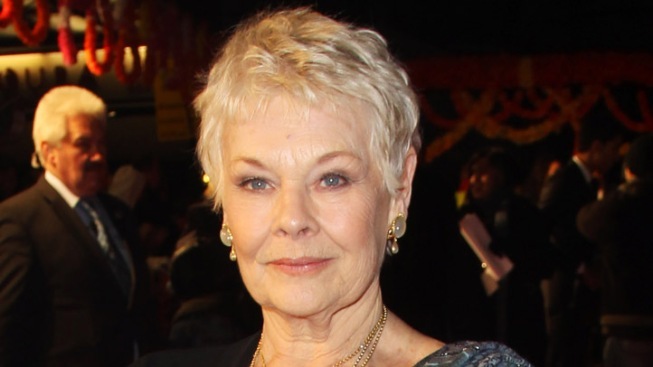 Dame Judi Dench, the Oscar-winning actress best known for being James Bonds' boss since 1995, is losing her eyesight. “I can’t read scripts any more because of the trouble with my eyes," Dench told the UK Mirror. "And so somebody comes in and reads them to me, like telling me a story." The 77-year-old actress told the paper that she is the victim of a condition that also plagued her mother, macular degeneration, which can lead to blindness. She says she's undergoing treatment that she hopes will stop things from worsening. "I know there might be something going on but sometimes I can’t see it and that infuriates me as I think I’m really missing out on something,” she added. She plans to invest in an e-reader that will allow her to make the text big enough for her to see, and start listen to more "talking books," which both her late husband, Michael Williams, and their daughter Flinty, have recorded.